I agree with the latest forecast from the NWS Storm Prediction Center. The risk of tornadoes is very low (but not zero). 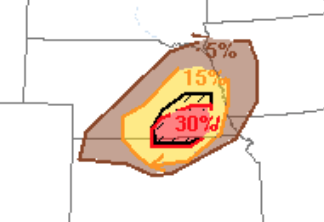 But, the risk of very large hail is relatively high. The hatched area is where hail larger than two inches in diameter is forecast to occur. I urge you to put your car and any items that could be damaged by hail inside.